If the Chinese people were to file one by one past a given point, the interesting procession would never come to an end. Before the last man of those living to-day had gone by, another and a new generation would have grown up, and so on for ever and ever. The importance, as a factor in the sum of human affairs, of this vast nation,—of its language, of its literature, of its religions, of its history, of its manners and customs,—goes therefore without saying. Yet a serious attention to China and her affairs is of very recent growth. Twenty-five years ago there was but one professor of Chinese in the United Kingdom of Great Britain and Ireland; and even that one spent his time more in adorning his profession than in imparting his knowledge to classes of eager students. Now there are all together five chairs of Chinese, the occupants of which are all more or less actively employed. But we are still sadly lacking in what Columbia University appears to have obtained by the stroke of a generous pen,—adequate funds for endowment. Meanwhile, I venture to offer my respectful congratulations to Columbia University on having surmounted this initial difficulty, and also to prophesy that the foresight of the liberal donor will be amply justified before many years are over. I have often been asked if Chinese is, or is not, a difficult language to learn. 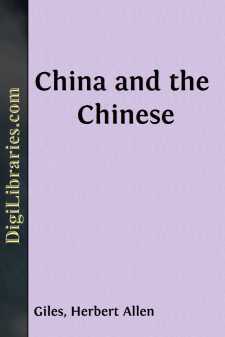 To this question it is quite impossible to give a categorical answer, for the simple reason that Chinese consists of at least two languages, one colloquial and the other written, which for all practical purposes are about as distinct as they well could be. Colloquial Chinese is a comparatively easy matter. It is, in fact, more easily acquired in the early stages than colloquial French or German. A student will begin to speak from the very first, for the simple reason that there is no other way. There are no Declensions or Conjugations to be learned, and consequently no Paradigms or Irregular Verbs. In a day or two the student should be able to say a few simple things. After three months he should be able to deal with his ordinary requirements; and after six months he should be able to chatter away more or less accurately on a variety of interesting subjects. A great deal depends upon the method by which he is taught. The written or book language, on the other hand, may fairly be regarded as a sufficient study for a lifetime; not because of the peculiar script, which yields when systematically attacked, but because the style of the book language is often so extremely terse as to make it obscure, and sometimes so lavishly ornate that without wide reading it is not easy to follow the figurative phraseology, and historical and mythological allusions, which confront one on every page.